Insulinoma is the most common functioning islet cell tumor of the pancreas, with an annual incidence of 4 cases/1 million individuals. It is treated by surgical methods. Open surgery was once considered the standard approach for the treatment of insulinoma. However, the procedure is traumatic and requires a large incision, which does not satisfy the growing expectations of minimally invasive management of small-sized tumors. Insulinomas are usually benign solitary tumors and mostly occur sporadically, which makes them suitable candidates for laparoscopic management. The potential advantages of laparoscopic management of insulinoma over open surgery include shorter duration of hospitalization, quicker recovery, and better cosmetic effect. However, because of the small tumor size as well as the depth and uncertainty of the location of the tumor, laparoscopic localization of the lesion without tactile sensation is difficult. Laparoscopic ultrasonography can detect about 90% of insulinomas, and its sensitivity is comparable to that of manual palpation along with intraoperative ultrasonography during open surgery; thus, it ensures the feasibility of laparoscopic management of insulinoma and reinforces its advantage as a minimally invasive procedure. 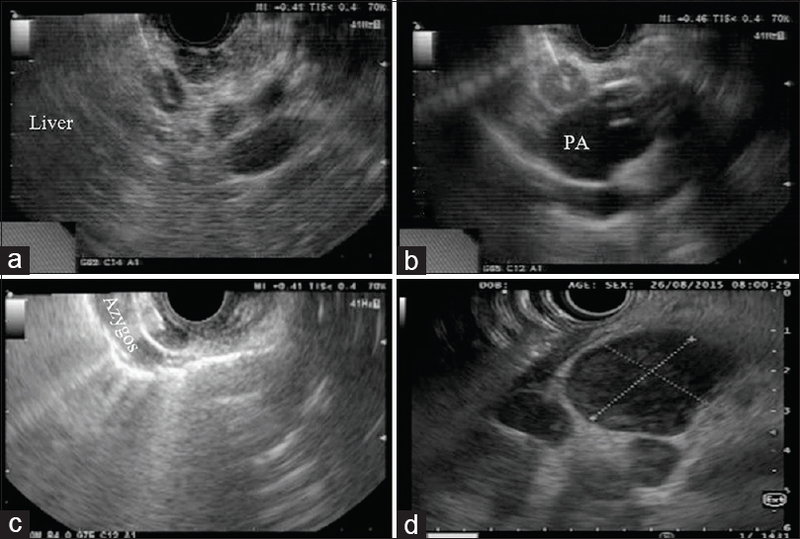 Laparoscopic ultrasonography is vital for the localization of insulinomas and characterization of the surrounding pancreatic structure and should, therefore, be considered an integral part of the laparoscopic management of insulinoma. Background and Objectives: Many cases of gastrointestinal (GI) tumors as lymphoma, adenocarcinoma, and most of submucosal tumors (SMT) such as gastrointestinal stromal tumor (GIST) and leiomyoma are difficult to diagnose as they frequently yield negative endoscopic biopsies. We evaluated the accuracy of endoscopic ultrasound (EUS) and EUS-guided fine-needle aspiration (EUS-FNA) in the diagnosis of endoscopic biopsy negative GI tumors. Patients and Methods: One hundred and nine patients with biopsy negative GI tumors were included in this prospective study. EUS and EUS-FNA were performed to all patients with cytopathologic examination. Results: There were 109 patients with endoscopic biopsy negative GI lesions, including 61 males (56%) and 48 females (44%), with the mean age of 54 years. Sixty-three cases (57.8%) were proved to have malignant lesions, among them there were 15 cases with high-risk GIST as proved by FNA and excision biopsy. Forty-six cases (42.2%) were proved to be benign; among them there were 21 cases presented with non-high-risk GIST. Endoscopic ultrasound had a sensitivity of 96.8%, specificity of 89.1%, positive predictive value (PPV) of 92.4%, negative predictive value (NPV) of 95.3%, and accuracy of 93.6%. EUS-FNA had a sensitivity of 87.3%, specificity of 100%, PPV of 100%, NPV of 85.2%, and accuracy of 92.7%. 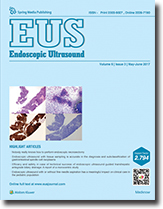 Conclusion: EUS with EUS-FNA is an accurate procedure in the diagnosis of GI tumors with negative endoscopic biopsies. Background and Objectives: Selecting the diagnostic procedure for mediastinal restaging after chemotherapy and/or radiotherapy in Stage IIIA-N2 non-small cell lung cancer (NSCLC) patients remains a problem. 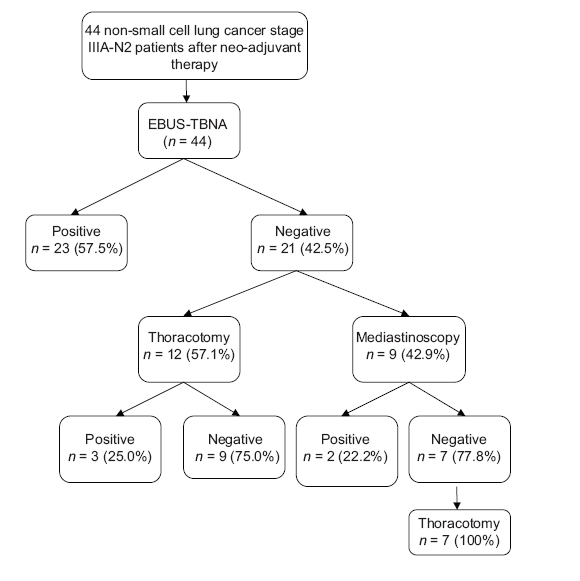 The aim of the study was to determine the efficacy of endobronchial ultrasound-guided transbronchial needle aspiration (EBUS-TBNA) for the evaluation of mediastinal lymph nodes in the restaging of NSCLC patients. Materials and Methods: The present multicentric study retrospectively analyzed the results of Stage IIIA-N2 NSCLC patients who had undergone EBUS for mediastinal restaging after preoperative chemotherapy or radiotherapy or both. Results: In 44 patients with 73 N2 nodes, malignant cells were identified in EBUS-TBNA from 23 patients (57.5%) and 25 lymph nodes (34.2%). Twenty-one patients (42.5%) and 48 lymph nodes (65.8%) were negative for nodal metastasis. All of these patients with negative results subsequently underwent mediastinoscopy or surgery (n = 9 and n = 12, respectively). Metastasis was detected in 5 (23.8%) of 21 patients and 6 (12.5%) of 48 lymph nodes. The diagnostic sensitivity, specificity, positive predictive value, negative predicted value and accuracy of EBUS-TBNA based on number of patients were 82.1%, 100%, 100%, 76.2%, and 88.6%, respectively. Conclusions: EBUS-TBNA should be done before invasive procedures in restaging of the mediastinum in patients previously treated with neoadjuvant therapy because of high diagnostic accuracy rate. However, negative results should be confirmed with invasive procedures such as mediastinoscopy and thoracoscopy. Background and Objectives: Subcentimetric (defined as <1 cm at short axis) lymph nodes are considered benign and there is limited literature on the results of fine needle aspiration (FNA) of these nodes. Methods: Endoscopic ultrasound (EUS) guided FNA was done on 189 lymph nodes in 166 patients with pyrexia of unknown origin (n = 113) or malignancy (n = 53). Subcentimetric lymph nodes (Group A) were compared to nodes with short axis diameter ≥1 cm (Group B). Data are shown as number, percentage, and median (25–75 interquartile range). Results: There was no significant difference between Group A and Group B regarding site of lymph nodes (mediastinal in 73.6 and 72.5%, abdominal in 26.3 vs. 27.4%), number of slides (median 14 vs. 15), needle passes (median 2), and needle used (22 G needle in 85.5% vs. 69.9%). Group A had significantly lesser long axis diameter (1.5 [1.2–2] vs. 2.1 [1.6–2.9] cm) and short axis diameter (0.7 [0.6–0.8) vs. 1.4 [1.1–1.6] cm). A diagnosis (pathologic or reactive) could not be made in 2 (2.6%) and 11 (9.7%) lymph nodes in Group A and Group B, respectively (P = 0.078), due to inadequate material. Respective diagnoses in Group A and Group B were reactive lymphadenopathy (51.3% vs. 18.5%, P = 0.000), granulomatous lymphadenopathy (34.2% vs. 53%, P = 0.011), and malignancy (11.8% vs. 18.5%, P = 0.231). The lymph nodes with granulomatous and malignant change were significantly larger and had higher chances of having sharply demarcated borders as compared to reactive nodes. Conclusion: EUS-guided FNA of subcentimetric lymph nodes have comparable results to larger nodes. Almost half of the subcentimetric lymph nodes are pathologic. Background and Objectives: Mesenchymal (spindle cell) neoplasms (SCN) of the gastrointestinal (GI) tract are an important subtype of subepithelial lesions that need subclassification to assess their malignant potential. Reported success rates of accurate subclassification with endoscopic ultrasound (EUS)-guided biopsies are variable. Our goal was to analyze our experience using EUS-guided TruCut biopsy (EUS-TCB) in the majority of patients. Methods: Retrospective analysis in patients who underwent EUS with biopsies for suspected SCN at our tertiary referral center between 2004 and 2013. Results: A total of 146 patients with suspected SCN underwent EUS with tissue acquisition. Thirteen patients were excluded from analysis because tissue acquisition established a definite diagnosis other than SCN. In the remaining 133 patients, tissue acquisition was diagnostic of SCN in 118 (88.7%) and nondiagnostic in 15 (11.3%). Subclassification based on immunohistochemistry (IHC) was possible in 109 of the 133 cases (81.9%). The final diagnosis was GI stromal tumor in 64, leiomyoma in 39, and schwannoma in 6 cases. The percentage of patients who were subclassified by the various EUS-guided techniques together was 72.18%, and the percentage of patients who were subclassified specifically with EUS-TCB was 61.65%. Tissue specimens that enabled a specific diagnosis based on histological or cytological characteristics in conjunctions with IHC were obtained with EUS core biopsy in 83 (TCB in 82 and ProCore needle biopsy in 1), fine-needle aspiration in 13, mucosal resection in 10, and forceps biopsies (bite-on-bite) in 3 cases. 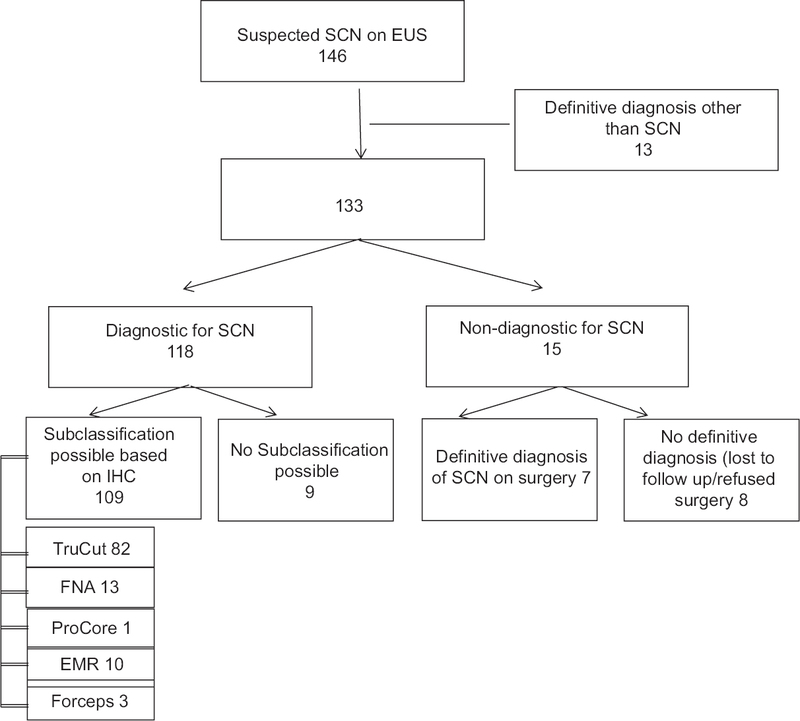 Conclusion: EUS with endoscopic tissue acquisition is accurate in the diagnosis and subclassification of SCN. In experienced hands, the EUS-TruCut needle is a valuable tool with a high success rate for this indication. Background and Objectives: Endoscopic ultrasound (EUS)-guided biliary drainage techniques are alternative procedures in cases of obstructive jaundice with altered anatomy or failed ERCP. 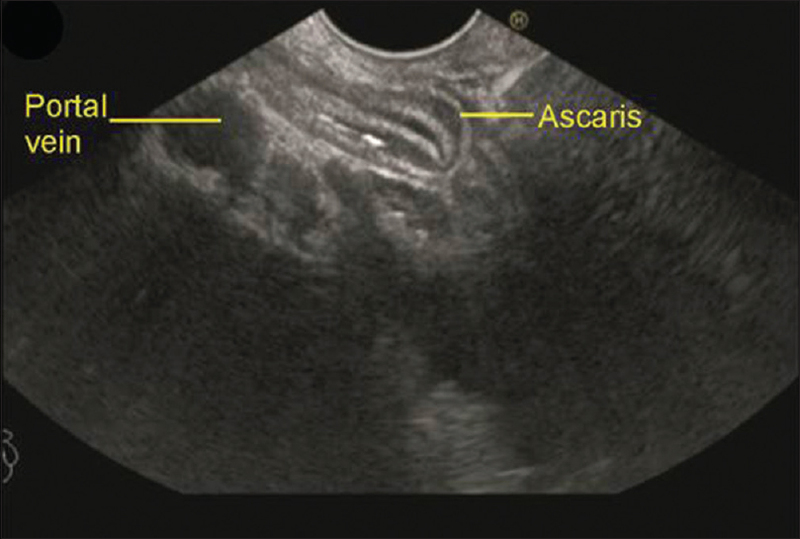 Complications related to EUS-guided antegrade drainage (EUS-AD) are still present in up to 10% of cases, and combination of procedures is sometimes suggested to avoid adverse events. The purpose of our study is to evaluate the efficacy and safety of EUS-AD with transhepatic access in case of technical success. Methods: We retrospectively reviewed patients who underwent EUS-AD in a single, tertiary care center. Results: Twenty patients were included (mean age 68), malignant stenosis in 95%. 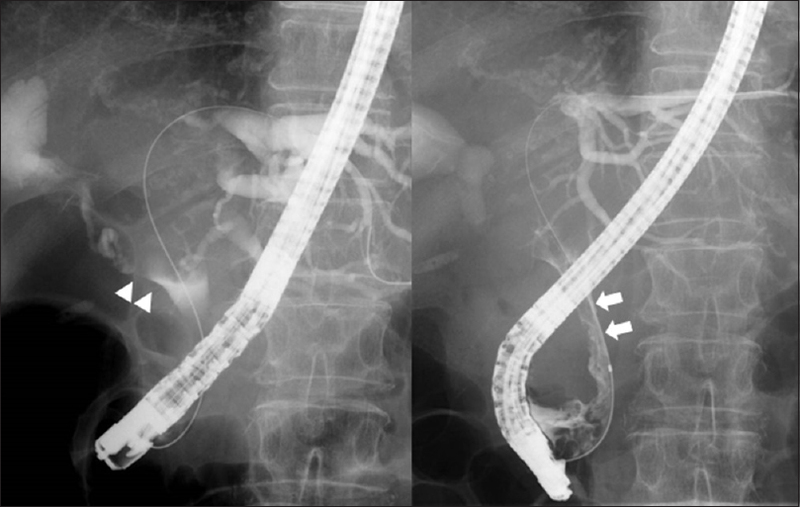 The reasons for EUS-AD were failed ERCP in 13/20, duodenal stenosis in 4/20, and altered anatomy after surgery in 3/20. A cystostome 6 Fr was always used to create the hepaticogastric tract, without puncture site closure. Self-expandable metallic stent (SEMS) was transpapillary in 95%. Drainage was completed in intraoperative stage by a EUS-hepaticogastrostomy (EUS-HGS) in 1/20 and by percutaneous drainage of the right liver (percutaneous transhepatic biliary drainage) in one out of 20. Overall clinical success was 17/20 (85%). One out of 20 presented a persistent obstructive cholangitis treated by another SEMS through ERCP. Two out of 20 patients died of infectious complications with incomplete drainage, in case of advanced neoplastic disease. One of these two patients was treated by EUS-AD and EUS-HGS at the same time. None of the 20 patients developed bilioma or bile leakage. Conclusion: EUS-AD by transhepatic way is clinically effective and safe. Closure of the gastric puncture site is not mandatory and complementary methods for biliary decompression should be combined in case of incomplete drainage and not to prevent potential adverse events. 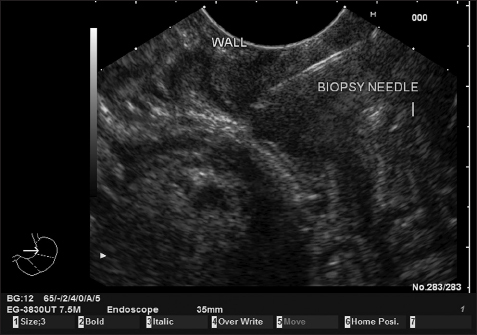 Background and Objectives: A Canadian Community Hospital launched a new Endoscopic Ultrasound (EUS) Program in 2011. The aim of this study was to report the accuracy of EUS-fine needle aspiration (EUS-FNA) of solid lesions over time as it pertains to cytotechnologists' involvement and learning curves. Methods: The electronic medical records of patients that had a EUS from July 2011 to January 2014 were retrospectively reviewed. Only solid lesions with FNA sampling were included in the study. The primary outcome assessed was the accuracy of specimen acquisition for pathological review. The secondary outcome was diagnostic accuracy. Cases were separated by chronological order into thirds for the assessment of learning curves. Cytotechnologists' involvement was correlated to determine its impact on accuracy. Results: Two hundred and seventy-one EUS-FNA procedures were completed for solid lesions. Cytotechnologists' involvement resulted in a specimen acquisition accuracy of 82.6%, compared with 68.8% without a cytotechnologist (P = 0.009; 95% confidence interval [CI] 3.2%–25.0%). Diagnostic accuracy was 74.2% with a cytotechnologist while 62.4% without a cytotechnologist (P = 0.038; 95% CI 0.3%–23.7%). The specimen acquisition accuracy increased from 73.2% from the first third of cases to 92.3% for the last third with a cytotechnologist (P = 0.004; 95% CI 6%–33.0%). Without a cytotechnologist, the specimen accuracy was 67.6% for the first third while 57.7% for the last third of cases (P = 0.434; 95% CI − 33.9–14.4%). In the multivariable regression analysis, after adjusting for other predictors, a present cytotechnologist (P = 0.022) and lesion size 21 mm–30 mm (P = 0.039) and >30 mm (P = 0.001) were significantly associated with increased specimen acquisition accuracy. Only a present cytotechnologist (P = 0.046) was significantly associated with increased diagnostic accuracy. Interpretation: Cytotechnologists' involvement significantly improved the accuracy of specimen acquisition. Although accuracy was impacted by a cytotechnologist learning curve, our results highlight the importance of a cytotechnologist being present for EUS-FNA sampling of solid lesions. Background and Objectives: The safety and utility of endoscopic ultrasound (EUS) for the evaluation and management of gastrointestinal (GI) tract disorders among adults has been established. The literature on safety and efficacy in a pediatric referral population (under 21 years of age) is limited. We hypothesized that EUS is safe and useful in the pediatric population. We reviewed the pediatric EUS experience at a single tertiary-care system. We describe the indications, findings, safety, technical success rate, and impact on clinical outcomes. Patients and Methods: All patients 21 years of age or younger referred for EUS between 5, 2007 and 11, 2012 were identified from our electronic medical record databases. Retrospective chart review was then conducted to document demographics, procedure indications, procedure type (diagnostic or therapeutic), type of anesthesia used, EUS findings, and the clinical impact of EUS on the subsequent management of the patients. Results: Seventy EUS procedures were attempted in 58 patients during the study. Of these, two EUS procedures were aborted due to inadequate moderate sedation and 68 were successfully completed. The median age at initial endoscopy was 18 years (range 6–21 years), 50% were male and 65% were Caucasian. Four patients underwent EUS-guided pseudocyst drainage. Among the remaining 54 patients, the indications for EUS were the evaluation of GI mucosal/submucosal lesions (n = 14), acute or recurrent pancreatitis (n = 10), localization of suspected insulinoma (n = 8), evaluation of pancreatic abnormalities seen on prior imaging (n = 6), surveillance of tumors or evaluation of luminal lesions in hereditary syndromes (n = 6), abdominal pain of suspected pancreatobiliary origin (n = 5), and other rare indications (n = 5). Fine-needle aspiration was performed in 13 (9 diagnostic, 4 therapeutic) and trans-gastric fine-needle contrast injection of the pancreatic duct was performed in one patient without any complications. Sedation (data available for 66 procedures) included general endotracheal anesthesia in 38 (57%), monitored anesthesia care (MAC) in 19 (29%), and moderate sedation in 9 (14%). There were 4 minor intra-procedural anesthesia-related complications (laryngospasm in 2 and hypoxemia from airway obstruction and secretions in 2) in MAC and general endotracheal anesthesia (GA) cases, and 1 postprocedural complication (fever after pseudocyst drainage). EUS can achieve the diagnostic or therapeutic goal and ruled out suspected pathology in 88% of cases precluding need for additional testing. Conclusions: (1) EUS in the pediatric population is technically successful and efficacious. (2) Therapeutic and diagnostic EUS impacted clinical care decisions. (3) There is a low risk of immediate significant complications. (4) The overall efficacy and safety support the performance of EUS in a pediatric population by experienced endoscopists. Background and Objective: Needle-based confocal laser endomicroscopy (nCLE) under endoscopic ultrasound guidance is a newly developed imaging technique for pancreatic lesions and lymph nodes, enabling a subcellular level of resolution. The confocal miniprobe is an invasive instrument designed to be reused up to 10 times. Therefore, a method that ensures the complete elimination of microbial contaminants on the device is necessary. We studied the bactericidal efficacy of the Stella™ system, which purports to achieve this objective. Materials and Methods: The surfaces of three nCLE miniprobes were contaminated with suspensions of Bacillus atrophaeus (ATCC9372). One probe was randomly selected to count the bacterial load on the surface. The other two probes were manually cleaned and rinsed. 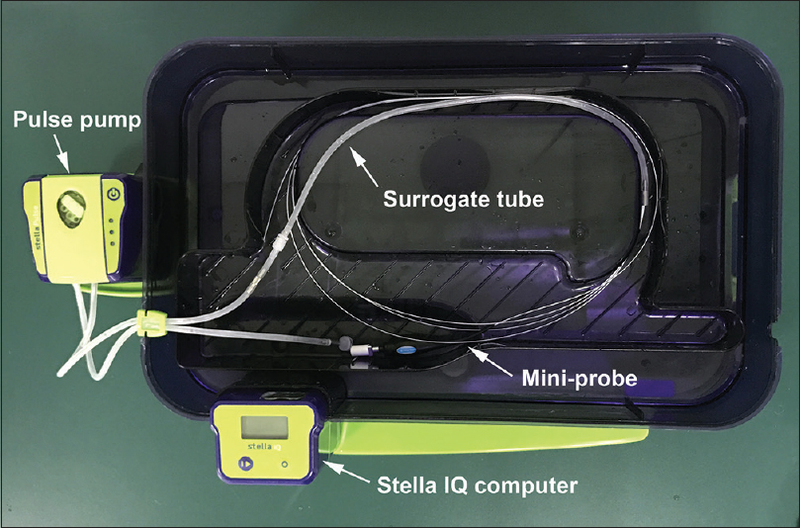 One probe was randomly selected to count bacteria on the surface, and the other probe was sterilized using the Stella™ 5L endoscopic sterilization system before obtaining the bacterial count. The process was repeated for 20 cycles to evaluate the microbicidal efficacy of the Stella™ 5L endoscopic sterilization system. These miniprobes were immersed in the Stella Fuse disinfectant for 72 h. After the 72 h of immersion, the weight loss of probes was determined using a high precision electronic scale to examine corrosion following disinfection. 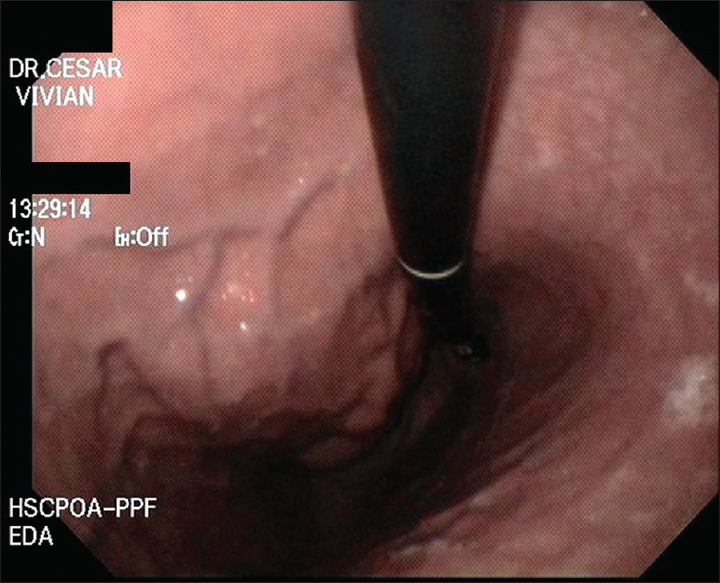 The change in image quality was evaluated by an endoscopist. Results: From an initial contamination level of 4.48 × 106 ± 1.57 × 106 cfu/mL on the surface of the probes, the bacterial count was reduced to 4.25 × 102 ± 1.95 × 102 cfu/mL after manual cleaning (including enzyme washing), and no microorganisms were recovered after 20 cycles with the Stella™ 5L system. The probe weights before and after 72 h of immersion were 45.769 (45.768–45.771) g and 45.762 (45.752–45.768) g, respectively. No change in image quality was observed. Conclusion: This study shows that the Stella™ 5L system is capable of the complete elimination of microorganism contamination in a short period and avoids the toxicity of typical disinfectants. It is a safe, cheap, and efficient sterilization approach that provides a new option for nCLE miniprobe sterilization. 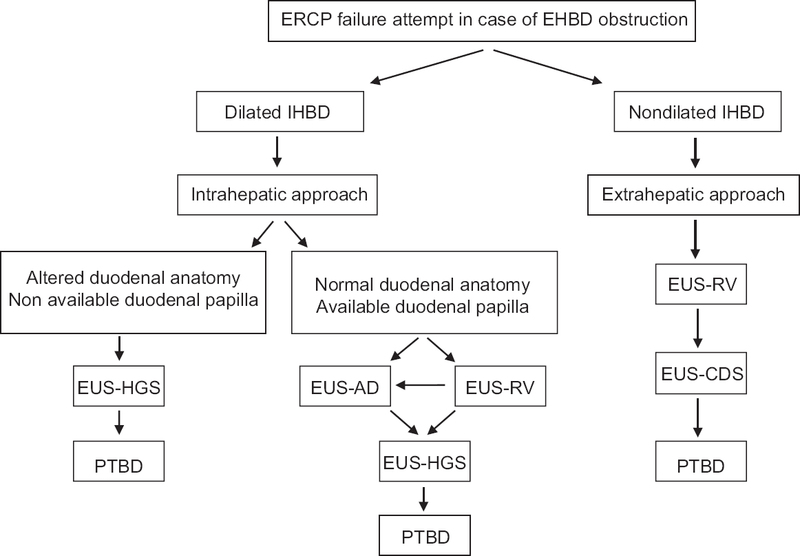 Endoscopic ultrasound-guided biliary drainage (EUS-BD) has been increasingly reported as an alternative to percutaneous transhepatic biliary drainage in failed endoscopic retrograde cholangiopancreatography. Moreover, conversion to EUS-BD can be a good alternative when transpapillary biliary drainage is technically possible but complicated by cholangitis because EUS-BD enables one-step internal drainage not traversing the tumor. Herein, we report a case of recurrent cholangitis due to hemobilia and cholecystitis due to tumor involvement to the cystic duct after transpapillary stent placement, which was successfully managed by conversion to EUS-BD and EUS-guided gallbladder drainage in one session.